This is a list of the 200 brightest galaxies according to the Third Reference Catalogue of Bright Galaxies. This is every galaxy in the catalogue brighter than magnitude 11.24. These galaxies lie in and around the Virgo Supercluster and some are as much as 100 million light years away. Column 1: The standard catalog name(s) of the galaxy. Column 2: Right Ascension of the galaxy for epoch 2000. Column 3: Declination of the galaxy for epoch 2000. Column 7: The blue apparent magnitude of the galaxy. Column 8: The angular diameter of the galaxy in arcminutes. 1/4=the galaxy is nearly edge-on; edge=the galaxy is edge-on. angular diameter and the distance. Column 11: The distance to the galaxy in millions of light years. S=surface brightness fluctuations, V=estimate from the galaxy's recessional velocity. Column 13: Constellation in which the galaxy lies. Reference Catalogue of Bright Galaxies. Springer-Verlag. Distance to NGC 5236 (M83) with the ESO Very Large Telescope, Astrophys J, 590, 256.
in Sculptor, Astron Astrophys, 404, 93. The SBF Survey of Galaxy Distances. IV. SBF Magnitudes, Colors, and Distances. Ferrarese L, et al, (2000), The HST Key Project on the Extragalactic Distance Scale. XXVI. Hubble Constant. Astrophys J 529, 745. Drozdovsky I, Karachentsev I, (2000), Photometric distances to six bright resolved galaxies. Astron Astrophys Supp 142, 425.
cloud. Astron Astrophys Supp 131, 1.
dispersion of the Hubble relation, Astron Nachr 317, 197. Tully R, (1988), Nearby Galaxies Catalogue. The oldest and most famous distance method first used by Edwin Hubble in 1922 to determine the distance to the Andromeda Galaxy. The method uses Cepheid variable stars - yellow giant stars which pulsate. The luminosity of these stars is directly proportional to the pulsation periods (typically a few days). By measuring their periods in other galaxies we can determine how bright and thus how far way they are. This method is usually used on spiral and irregular galaxies which have large numbers of Cepheids. It is very accurate but requires very powerful telescopes and is time consuming. This is an umbrella term for several related techniques. At its simplest this method involves looking for the brightest supergiant stars in a galaxy and assuming that they have a standard luminosity. More sophisticated techniques such as the Tip of the Red Giant Branch (TRGB) method and the Red Clump method look for red giant stars at particular extreme states in their lifespan when they have the same general luminosity. The very brightest planetary nebulae have the same luminosity. By observing planetary nebulae in other galaxies we can determine their relative distances simply by measuring how bright the brightest planetary nebulae are. Planetary nebulae are easy to see in other galaxies because they emit light in very specific wavebands and therefore can be observed with filters centred on these wavebands. Ironically, nobody knows of a good method for determining the distances to dimmer planetary nebulae in our own galaxy. The average luminosity of globular clusters around galaxies tends to be very similar. By observing large numbers of globular clusters around other galaxies we can determine their average luminosity and hence the distance. This method works best on elliptical galaxies because the globular clusters can be easily detected against the smooth background of an elliptical galaxy. The further away a galaxy is, the smoother it looks on a photograph. A galaxy twice as far looks twice as smooth. This can be used to accurately measure the distance to the galaxy, although you need to subtract the contribution from the globular clusters around the galaxy which make a galaxy look less smooth. Large numbers of distances to other galaxies are being produced by this technique although it works best on elliptical and lenticular galaxies or on spiral galaxies with broad smooth central bulges. By far the simplest technique for determining a galaxy's distance is to measure its velocity. In a uniformly expanding universe a galaxy with a larger velocity lies further from an observer than one with a smaller velocity. 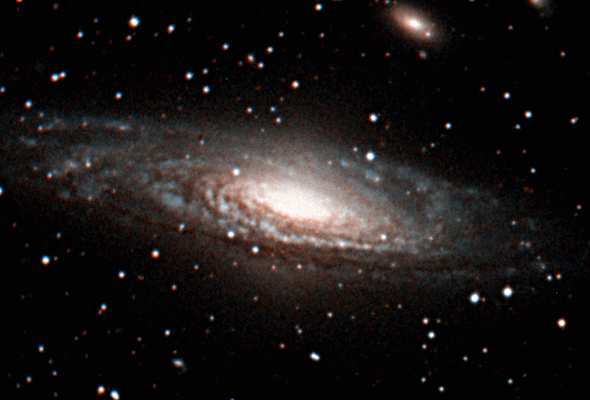 It is very easy to measure a galaxy's velocity with a spectroscope - hundreds of thousands of galaxy velocities have been measured. Unfortunately galaxies also have a smaller random motion which always means the estimated distance will be uncertain by several million light years. Noone cares if a galaxy 1 billion light years away is uncertain in its distance by ten million light years, but it obviously matters if the galaxy is only ten million light years away. For galaxies in the Virgo supercluster a correction needs to be added to a galaxy's velocity because of the pull of the Virgo cluster which is dragging galaxies towards it. NGC7331 - A large spiral galaxy 48 million light years away.